It was another exciting time for me to get my nails professionally done again. For this year, I have decided to do a winter theme nails instead of a Christmas one. 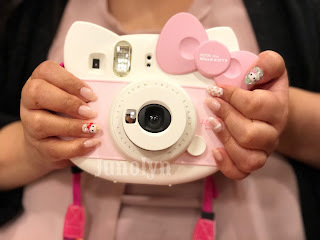 There aren't a lot of Hello Kitty nail art designs that I like because my preferences are rather picky. So, I was surprised to find one on Instagram that I liked so much. 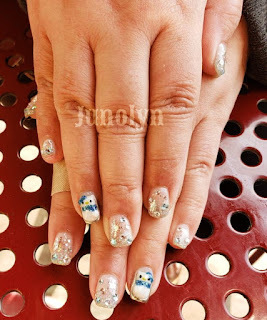 Rie from Marie Nails replicated the beautiful art work on my nails. It turned out really pretty and sparkling for the holidays. The colors of blue, white, and silver enhanced in a pretty shimmer every time that I moved my hand in the air. This particular nail design has one silver shimmery partly painted on all my nails except for one nail. The one finger nail has a silver Chrome style. It's a very expensive style, but worth it. I've always thought a Chrome style has that shiny polish that is just perfect for the New Year. I'm thinking of adding a Chrome nail style as my annual tradition when getting year end theme nails, whether it's for Christmas, winter, or New Year. Have I said it enough? I'm just in love with my new set of nail design. I keep repeating it, but I definitely adore how my nails sparkle. It's a dazzling beautiful shimmer of light blue and shine. It kind of looks like a simple design, but it isn't because there are stones and a set of Snowflake stickers. The light blue stones are a very beautiful color, while the silver ones sparkle every time light hits it. Unfortunately, the silver Snowflake stickers can barely be seen. I think a white Snowflake sticker would have made a difference. Until next year, have a Merry Christmas! Before Sanrio turned my life upside down, the world was full of wonders. 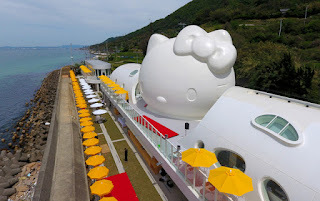 It was a city bustling with energy as Sanrio had just taken over the world. Suddenly, where there was no magic in the world--- it was everywhere you went. Humans had to adapt to their world not being theirs alone anymore. They had to share it with us, characters. They had to adjust their reality. They had been used to obsessing over us in cartoon films and on paper. Now, they had to get used to us being real. 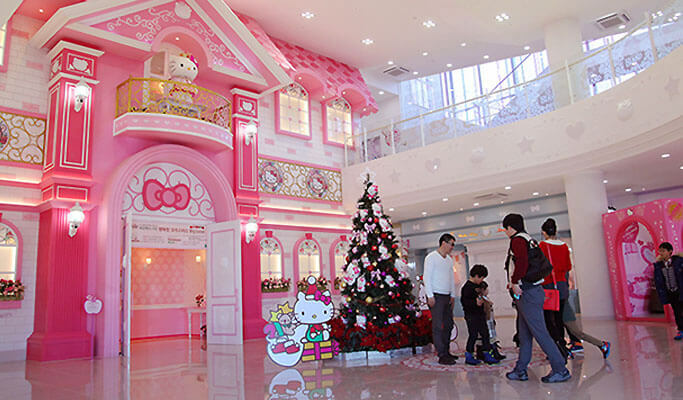 Living in their world-- er, Sanrio World. Technology is amazing. Amazing, but dangerous. The humans did not expect that with advanced technologies came with consequences. They are the creators of life and it became their downfall as they let their greed rule every action they did. 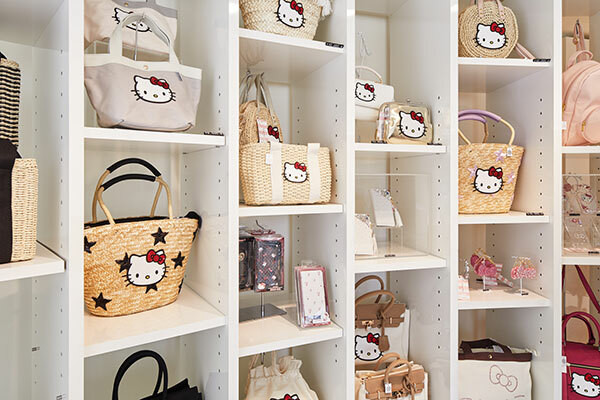 Like any brand that started, Sanrio had good intentions. They were good people. Like many others, greed for power and money corrupted them. Once they took over the world, all characters were given the same rights as the humans. It came with a price. The price of innocence and good. You replace one evil, another one just steps into the role and fills it. Humans never learn from the mistakes made in the past. They continue to live life like they are the most important beings in the entire universe. Who made them special and self-entitled? They are seen on the streets stalking their favorite Hollywood Starlets-- going about their lives as usual. Even with the new pecking order, humans believe that these characters come to life are their personal property. Like with their own race, they fight among themselves for any differences that they deem as their standard way of life. Humans might love these characters, but they do not like to share the resources. This is the struggle for the characters come to life. It's very difficult to stay "good" in a world that won't let you. It's either be crushed or do the crushing. It's that time of year again. It will be Christmas in less than two months. Are you ready for it? Most of us probably would give an answer of no because time is money and we're almost always behind in schedule. I sure am behind in schedule. There doesn't seem to be enough time in a day. So, to get you prepared for Christmas--- I have chosen my recommendations for the holiday. Here are three items on the list that gives the spirit of Christmas. If you haven't gotten over the Christmas music and the holly jolly cheer, then continue below for you or your loved one's gift. Godiva is right on time! They have produced another Christmas themed small plush to go along with their famous chocolates. Pretty in red, this year's Hello Kitty plush has a red Santa-like outfit with round shaped ears that has a white heart on each side. Truly a combination of classic and kawaii all together. 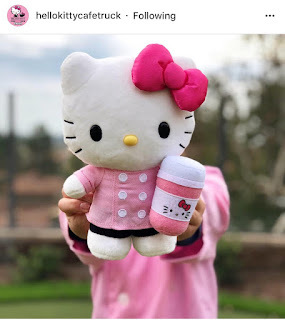 This plush will be available starting November 19. 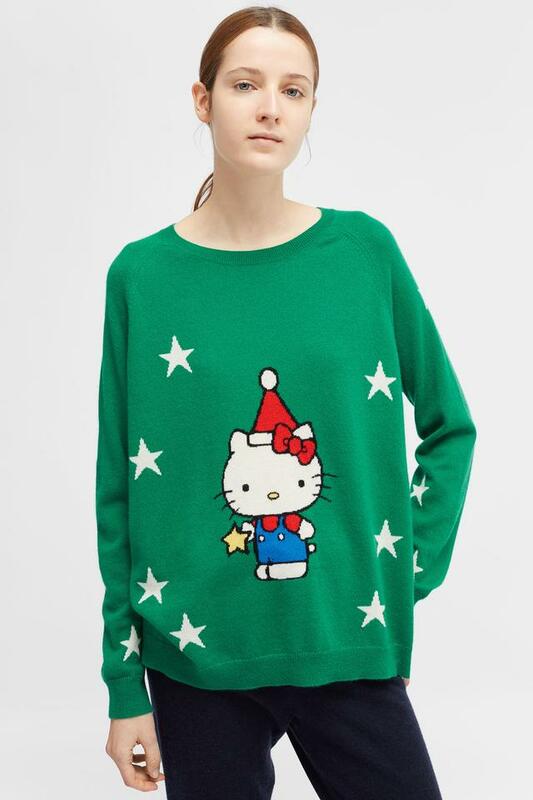 If you're like me, then you're looking for a Christmas themed sweater that isn't too out there in design. This one is just perfect. Not too flashy or bright in colors. 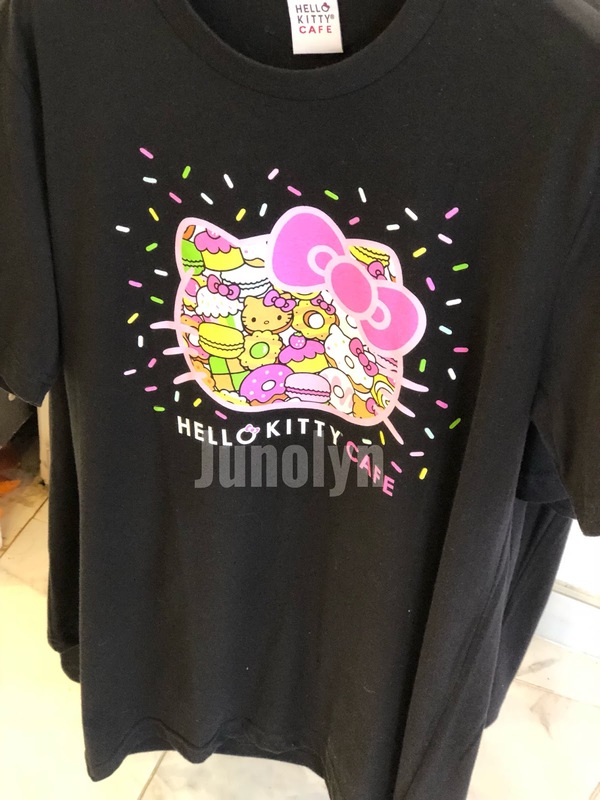 Nor is the image of Hello Kitty too overly large and at center on the chest area. It's a perfect way to blend in with the crowd. You can order here. It's THE perfect dress for the annual holiday party, where you have to make an effort to make yourself pretty. And, you know, to show off a new dress to your friends and family. We all live to celebrate life. 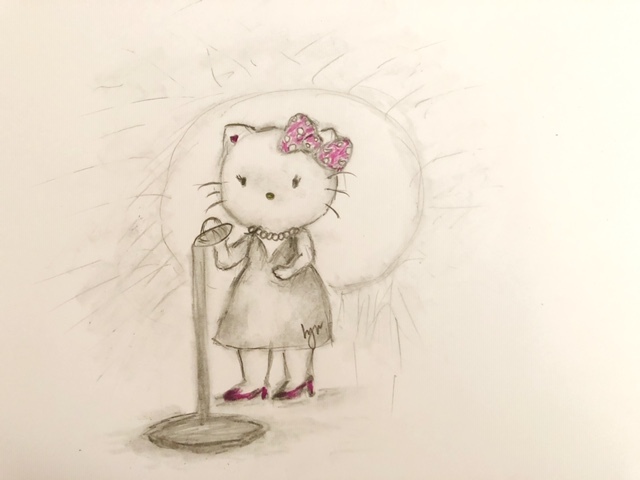 What better way than to show off your favorite character and wear a very first classy HK themed cocktail dress? Shhh! Hide those price tags from your Hubby until after the holidays! 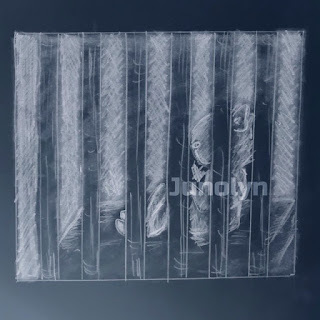 I will be making a matching Little Twin Stars intro for my Youtube Channel, Junolyn Tube. For me, I like to be able to show my artistic side through many platforms. 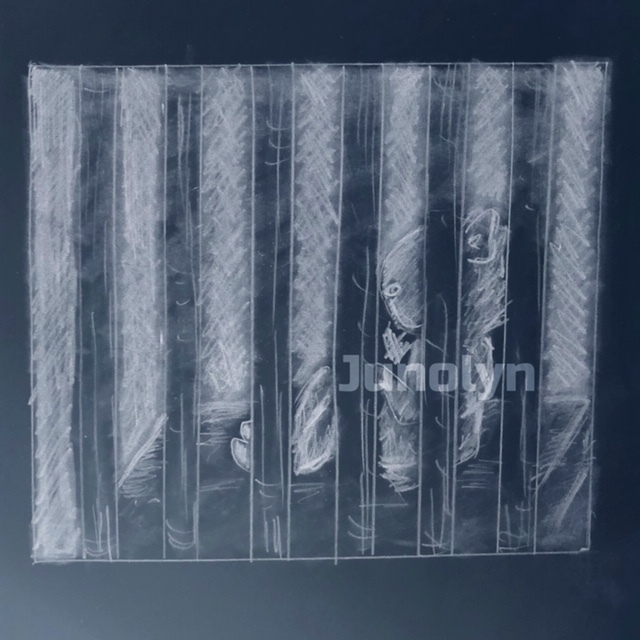 I've been wanting to work on my Youtube Channel: Junolyn Tube for a long time, but never really did anything about it. Oh woe is me. You've forsaken me. the rest of my lonely days on earth. succeeded whereas I have failed. 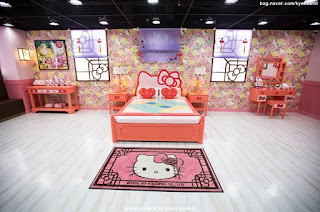 daisies as gifts to Hello Kitty and her harem. O Pippo, Pippo, wherefore art thou Pippo? 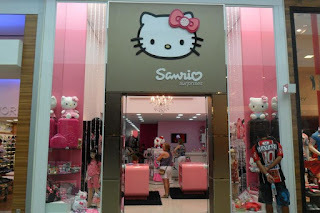 Here's an update of actual Sanrio stores in other countries like Europe, Oceania, and South America. Excluded from the list are USA and Asia. There doesn't seem to be any official stores in Canada, Australia, or any other places of Europe besides the one listed. Facebook link here and here. Yelp link here. Below is a list of stores not yet confirmed if still in business. 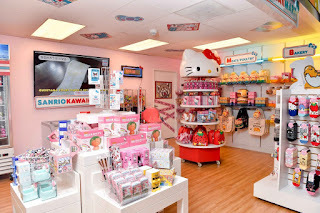 The only Sanrio boutique in Los Angeles--- in the heart of Little Tokyo downtown area. 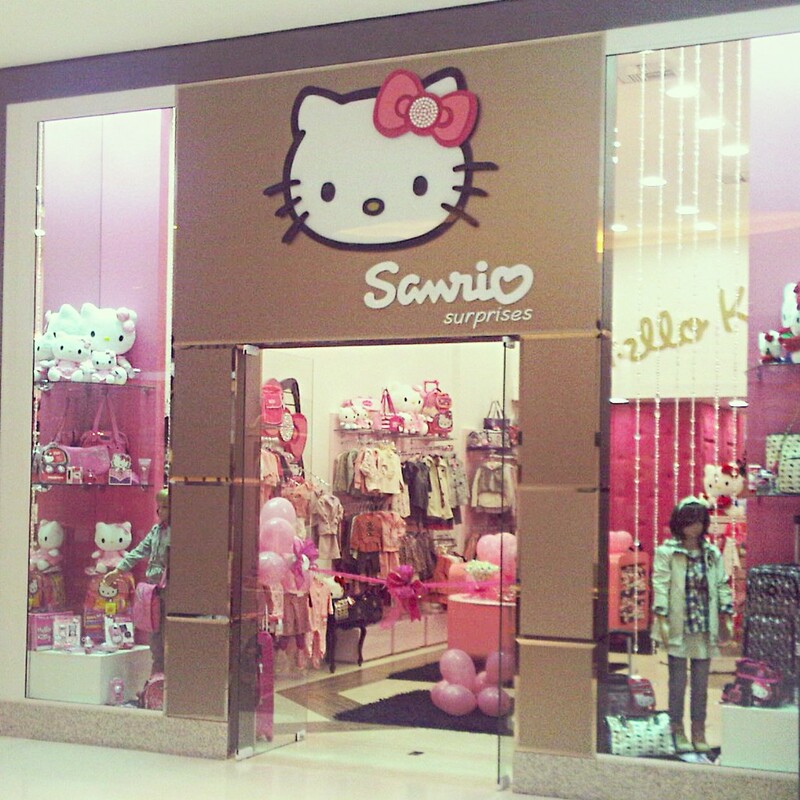 I remembered when it had just been a regular store filled with cute things. Now, it has been transformed into something amazing. 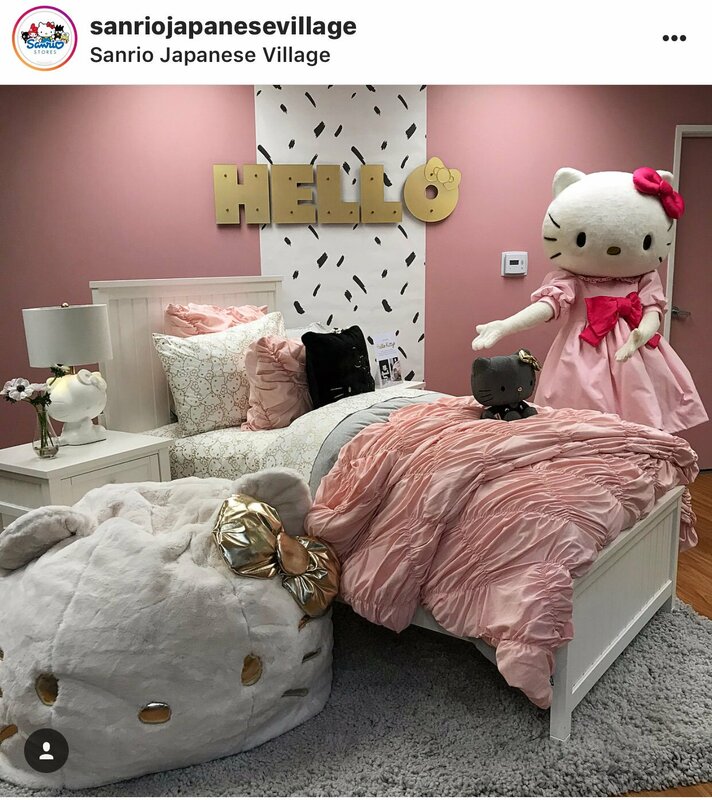 At first, it started off with a few clothing racks at the back, but then-- they started adding more of a kittified display that catches your eye instantly. 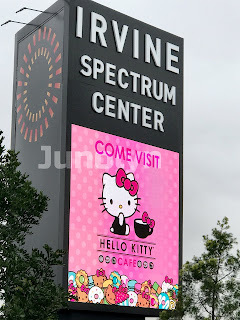 That big HK round display is so very cute! The boutique has become one of Little Tokyo's trendsetting hipster spots in Los Angeles. By adding more clothing racks, mannequins, a large wall of art, and even a showroom to display new released collaborations--- they have transformed into a wonderland of fairytales, if you can imagine. Something so extraordinary, this place is where to be. This is the only store that I have encountered that sells more Sanrio clothing options than ever before seen in the past. Not only do they sell regular tees, they sell fashionable wear tops that have you tempted to buy, even if it's not your favorite Sanrio character. The store in essence has become ultra cool. 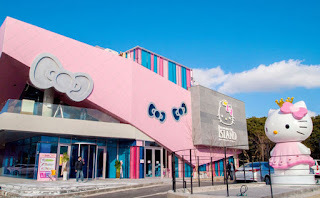 It's something that even guys can enter without feeling too awkward and embarrassed to be seen inside. For that reason, it's all thanks to Sanrio's newer characters, Gudetama and Aggretsuko. While I'll never be a fan of these two (an egg and an aggressive red Panda), I can see how that they would spark a following and become so popular with a new set of audiences. I'm more into cuter characters and Sanrio's newer characters are just the opposite. 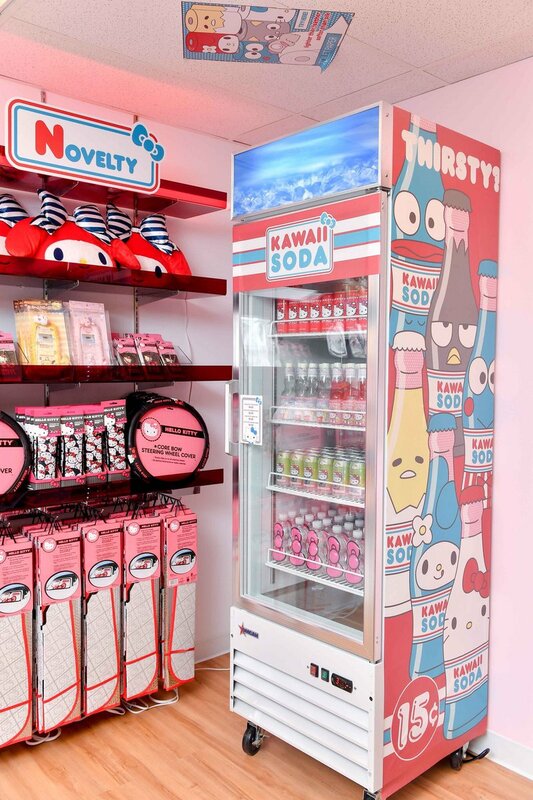 If you have been following the boutique on IG, then you would have seen it transformed into an Aggretsuko store. They promoted the new character with a bang. It was top to bottom filled with Aggretsuko clothes on the tall mannequins, photo-op displays in the showroom, and a huge wall section just dedicated to Aggretsuko. It was truly a sight to see. Sanrio has achieved something that they haven't done in a while. Bring in new fans. With this new change, this location has become a hotspot to put on your bucket's list of places to visit. 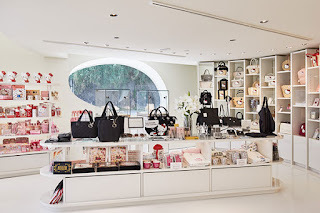 Also, the location is a big factor that helps the boutique's popularity. 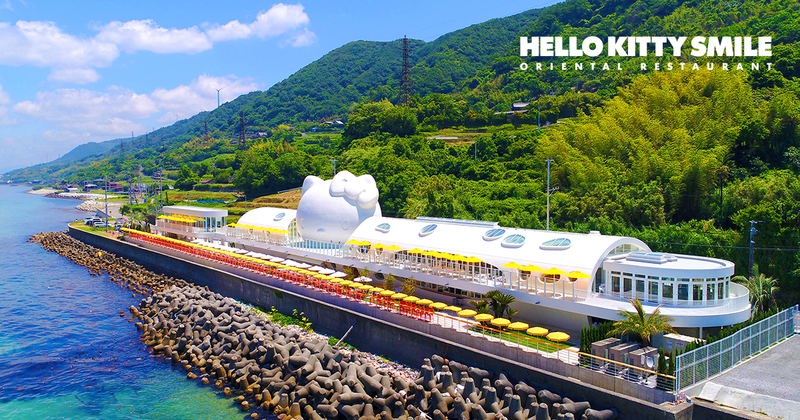 Japanese Village Plaza has been known to have Japanese festivals and events, which brings in crowds of people. 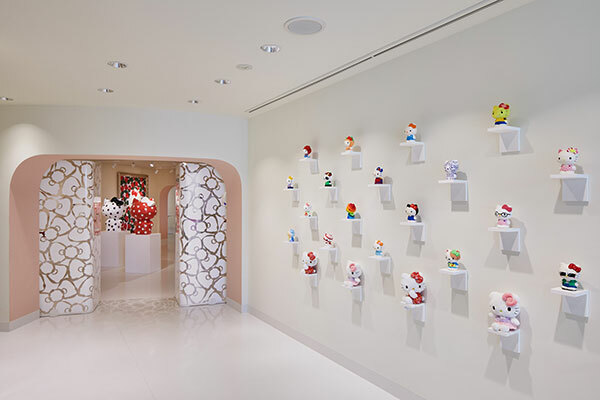 It's also the place to visit when they held an autograph signing for a Tokidoki artist, who had done a collaboration with Hello Kitty. With recent collaborations, the boutique has transformed into a showroom to showcase the selected items, whether it be clothes or home decor. With these new changes, the boutique has turned into something iconic. The level of standards for regular boutiques has just been raised to the next level. Before social media took over majority of our lives, art food creations wasn't even a pop culture trend. Nowadays, there are so many themed food creations popping up all over the internet. Everyone is fascinated with the beautiful creation of art. Art does not only come in a painting, but it can come in different forms: food, botanical, crafts, decor, etc. 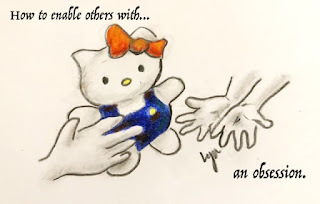 Can Sanrio change most of Society's preconceived notion of Hello Kitty? It's the question that I have been thinking about lately and wondering about Sanrio's latest strategic move. Some people will buy into the superficiality of a moment by using an event or decorated surroundings as a fond memory to create. I believe bonding memories help heighten the experience and therefore, complete their expectations of how things should be. It would mean that their time and efforts had not been wasted. I accomplished what I came to do like many others before me have done. 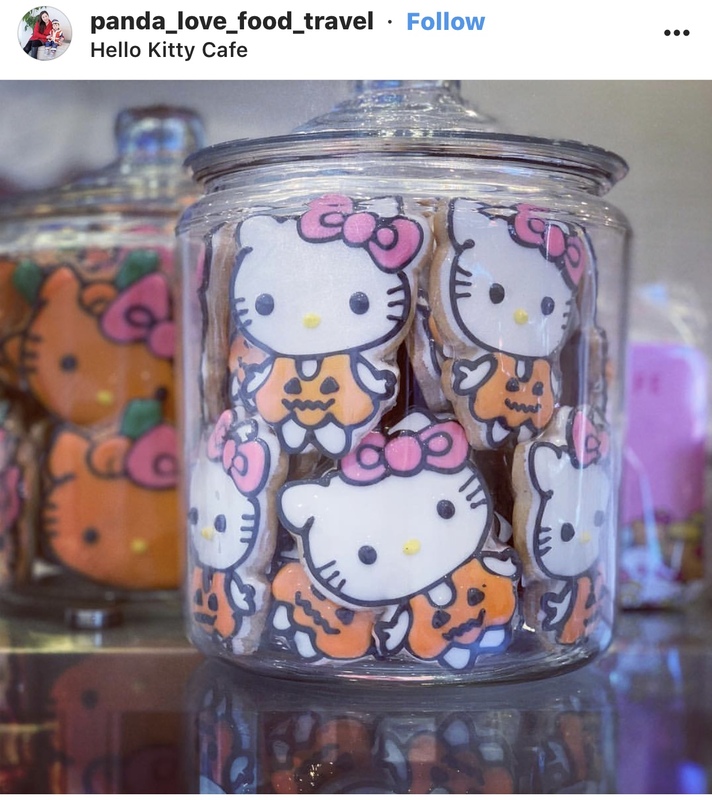 We have bragged on our social media by uploading photos from the Hello Kitty Cafe. I believe the reason why people gravitate towards character theme cafes is because it's something new from ordinary restaurants that have no theme or gimmick to offer. These character theme restaurants benefit through social media. If you think about it, these type of restaurants wouldn't succeed at all without today's advanced technologies. It says a lot on the superficial aspect on this, right? So far, I'm still waiting for that one special restaurant that has experience in crafting art food without sacrificing your tastebuds. 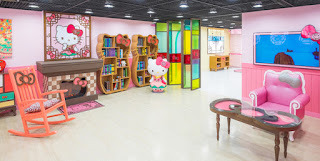 From the very first announcement about a real potential permanent brick-and-mortar Hello Kitty cafe, I have finally began to see Sanrio's new strategic moves. 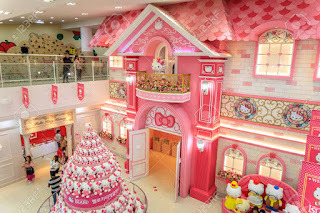 First was the successful Hello Kitty Convention. It brought back older fans and gained new fans. 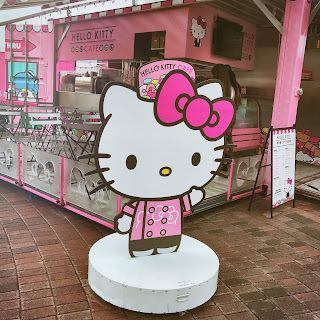 Then came, Sanrio Festivals that had a goal to tour all over the United States. Unfortunately, Sanrio had to cancel tour dates halfway. I do believe that they were not making enough profits to continue forth with the project. Next on their list of moves was a food truck. 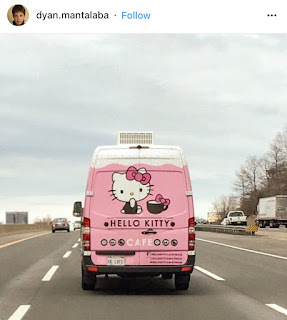 A mobile truck that sold mostly pastries and beverages with a few Hello Kitty exclusive products like a bow headband, plush, cup, and a t-shirt. There are two trucks that have been traveling all over California since Hello Kitty Con 2014. As of recently, they have traveled as far as to Arizona and Kentucky. With this USA tour, they are just carrying the basic necessities to feed the crazy obsession for a cat with a bow. 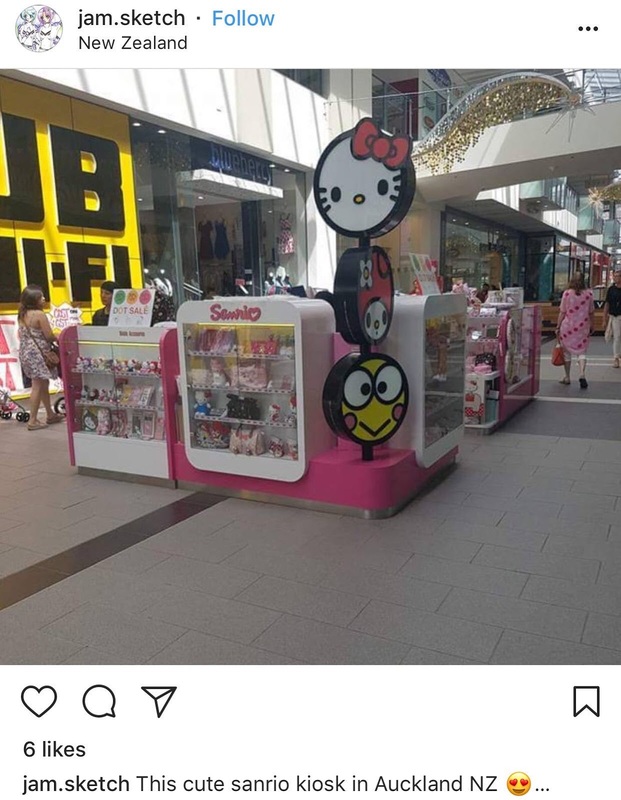 Sanrio knows that there are people willing to shell out money for Hello Kitty, especially with Sanrio stores having disappeared across the country. Excluding Los Angeles, of course. At the time, I never understood why they would offer very low quality type of pastries. It was baked off site and served cold from the fridge. At least in Starbucks, they offer to warm your pastries. When the gimmick stops selling, so does the profits. If you serve low quality food or pre-baked desserts, be prepared to see it close down after the hype disappears. 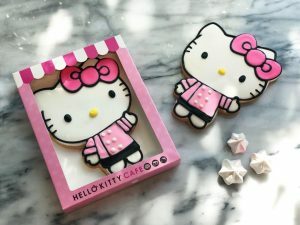 If a business like Sanrio cannot respect the food industry by producing quality food, then they shouldn't be putting their brand on a craft that they have no business venturing into. Nothing profits from greed. After the hype died down, I made my very first visit to the only Hello Kitty Cafe in America. While at the time it may have been a metal shipping container, it was close enough to the real thing. When I got there, there were no long lines. 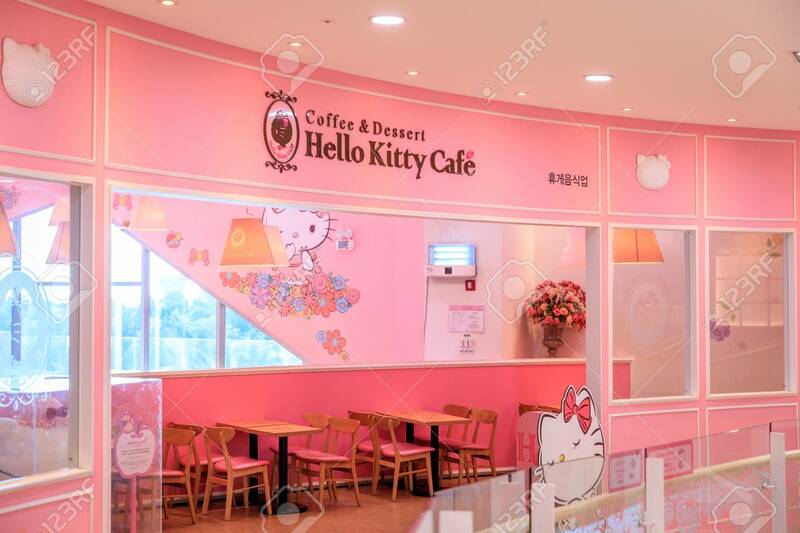 This will become a pattern as statistics don't lie... case in point, Asia's Hello Kitty cafe restaurants. I've been to the Arcadia location when they had the kiosk. After debuting a few months out of the year that they were there-- there were no long lines because the first time customers already fulfilled their bragging rights on their social media accounts. These are the same people who gravitate to the next exciting activity to post on their Instagram. 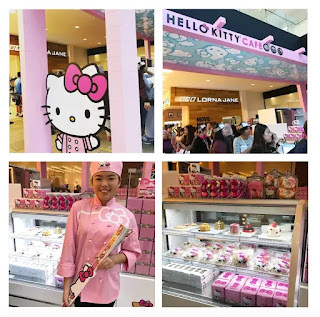 They've already seen what Sanrio can offer and with the truck and kiosk, it's not that impressive compared to a real bakery or cafe. Mama's Apple pie is not all that fresh. If it's cold, it is because it had came out of the refrigerator. Most baked pastries lose their freshness when refrigerated. We're talking about a cafe that's supposed to serve fresh and tasty food, even if it's a "fast casual" type. 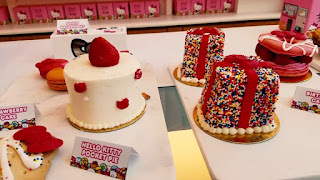 The top Hello Kitty shaped head fell off the pie before I had even dug into it. 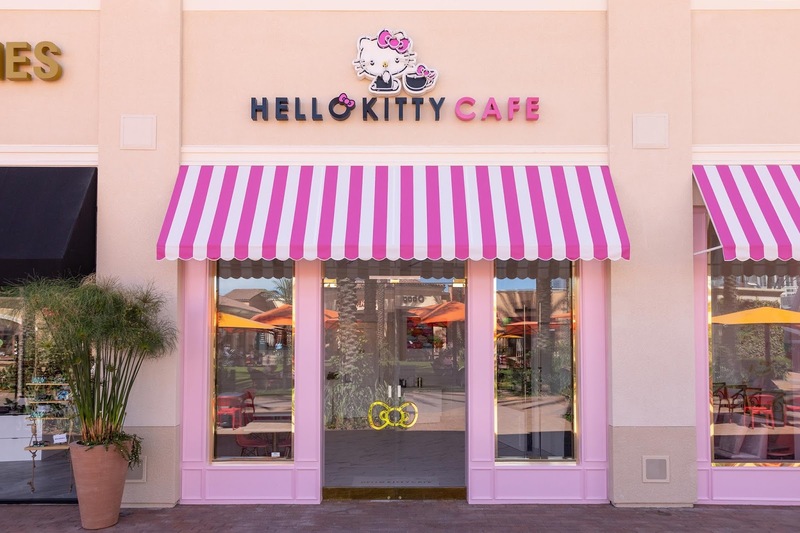 They take the design to a very lazy fast casual style to heart! Mini cakes at room temperature setting or warmed, taste better than stale cold. Macarons in the box set are average. It's much better than the cold apple pie. There's nothing wrong with their drinks, but it also can be said that they're nothing out of ordinary with taste. 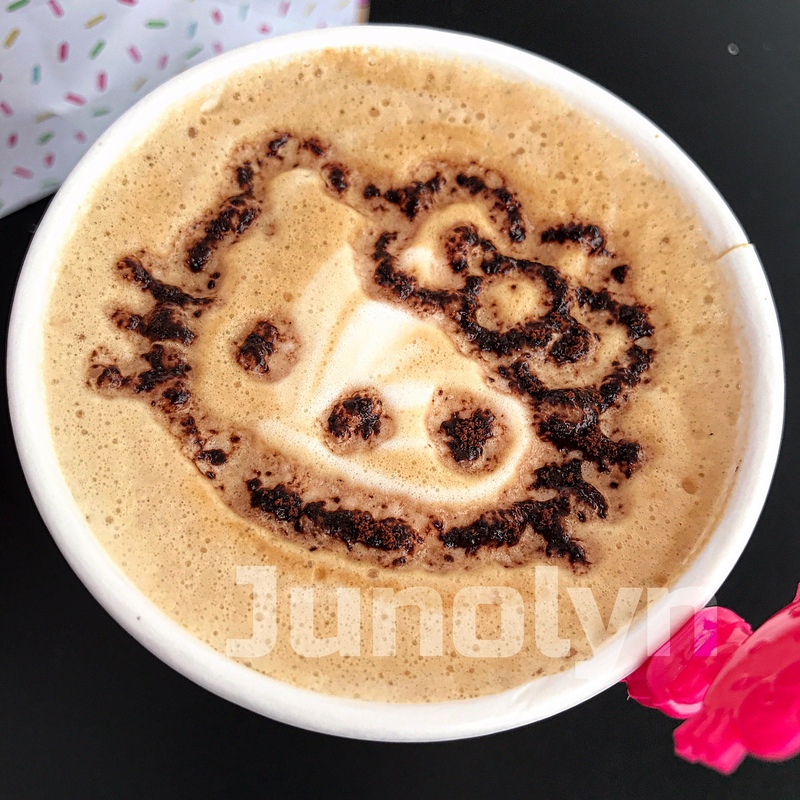 The only thing that stands out is the Hello Kitty art foam on a few of the hot drinks because it's picture worthy. Target Audience: Orange County adults with $$. Less profits if it was located other than Irvine-- like Los Angeles? 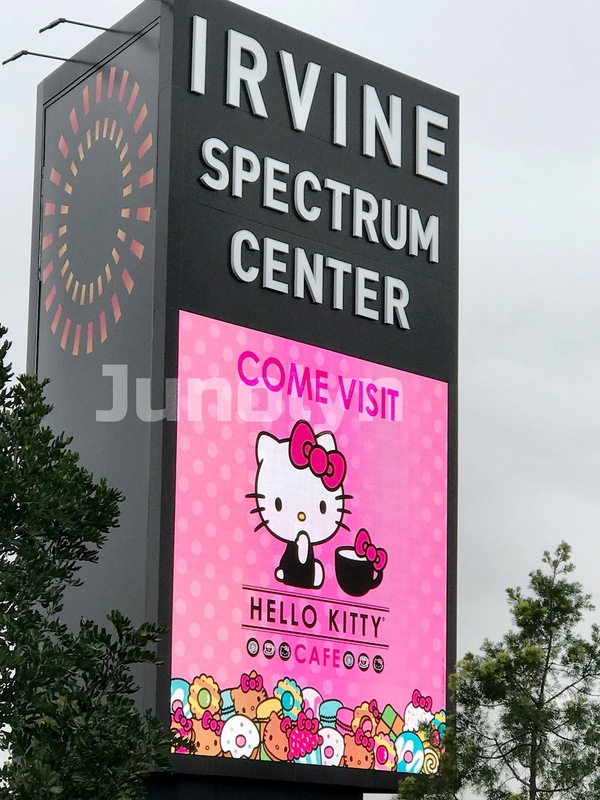 Are there just more people willing to spend in Irvine than in Los Angeles? Are there more upper middle class Americans living in Orange County? I have heard that if you can make something cool and a popular trend, then rich people are more willing to spend on an obsession. 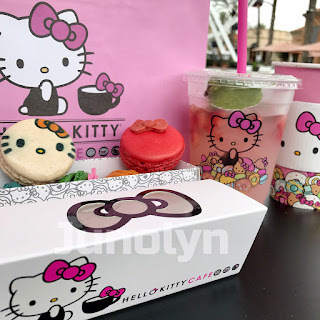 They priced everything expensive to justify the Hello Kitty experience that you cannot get anywhere else... other than Disneyland, but that is a rival character and has a costly ticket price to enter the theme park. They are taking advantage of people's obsession with things to show off on their Instagram. Anything that will make them appear cool, many people will document their experience on social media. Hey, it's a thing, ya know? The difference to note for this Hello Kitty Grand Cafe is the hidden reservations only, The Bow Room. 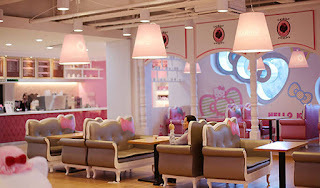 Touted as the hidden Pink Oasis room that serves high end tea service in the afternoon. By evening, it transforms into a cocktail bar. They dim the lights to match the nightclub bars (minus the music) that like the dark atmosphere. Chef Cookie is best eaten warmed from the microwave. It can taste stale. No doubt cakes can get stale if it's been refrigerated for too long. Another way to bring return customers is to offer seasonal items like these Halloween cookies. Definitely very Instagrammable. I fall for it every time because I love cute things and I can't get it anywhere else. 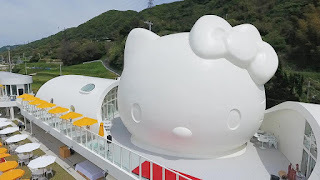 Out of all the Sanrio character cafes introduced in Asia, this location has a different service to offer. 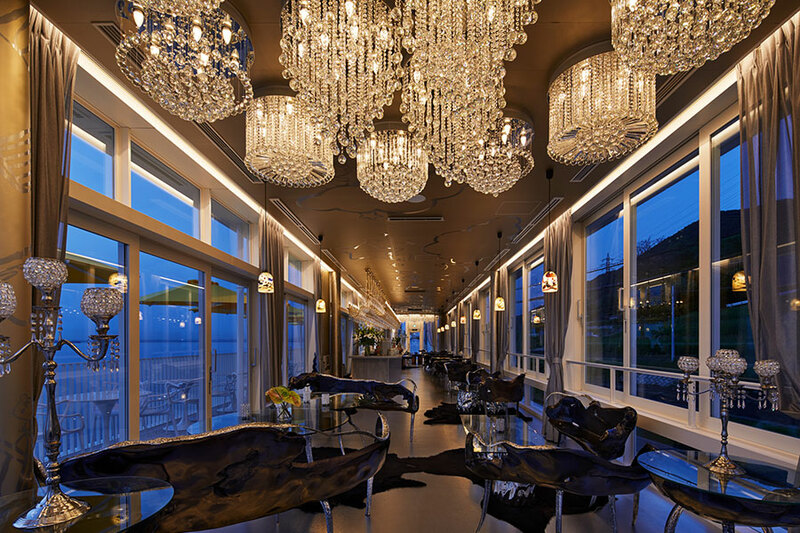 It stands out as to having a hidden reservations only, The Bow Room. It's a separate pink oasis room behind the storefront. You can only access this room unless you have a reservation. Walk-ins are only if there are tables available. The best dates to reserve or try walk-ins are during the weekday for the tea service and bar. Keep in mind that holidays may be more busier than usual. My first time at the tea service was a great and memorable one. It was part of my Birthday Weekend. I had just got my nails professionally done in preparation for this fun day. The overall experience did not disappoint. As you would expect when you walk into the Bow Room, it is like stepping out of this world. It's so different from any ordinary restaurants out there. 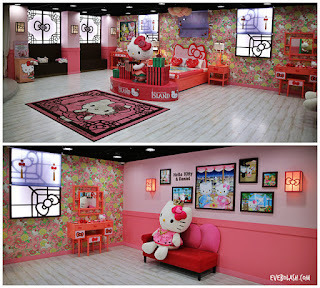 The pink room is decorated in Hello Kitty with a touch of class. 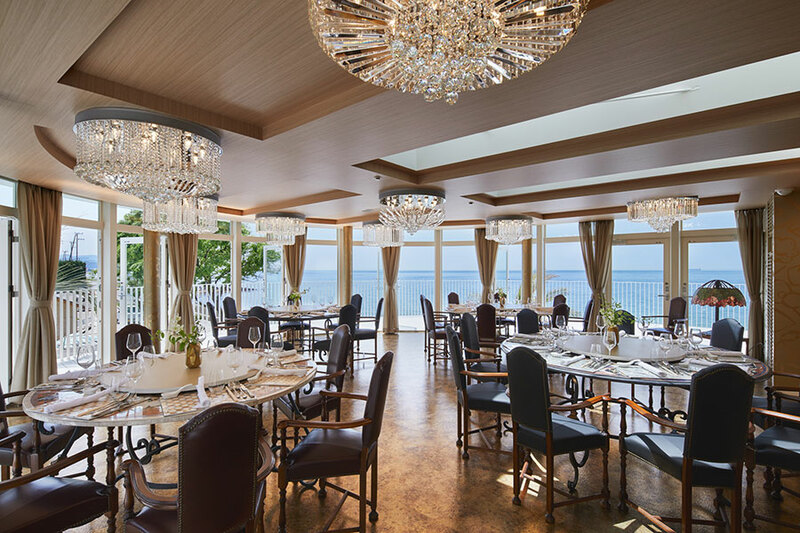 The Bow Room is designed for adults in mind who like the subtler touches or are not a fan of kitsch. 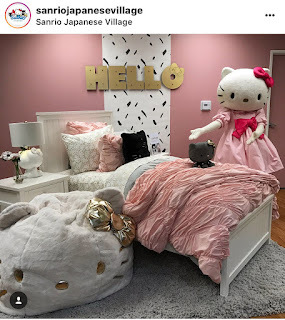 In order to change the perception of their Hello Kitty brand from kitsch to cool, I would think that Sanrio would have to be careful as to how they would approach the designing of the hidden room. If you go overboard in low quality design, you can be seen as a tacky establishment (by the majority vs. others). Hello Kitty is not exactly well loved by the masses in the UK, Australia, Switzerland, etc. It's a different culture over there. 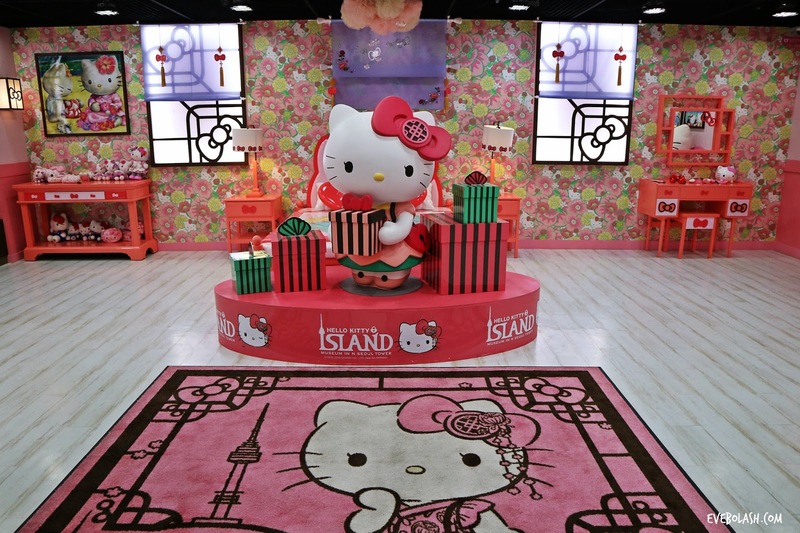 Hello Kitty is seen as a toy's brand in those countries. The exception to this image are in Asia and United States. To this day, there are still many adult Americans who prefer Disney over Hello Kitty. It's something that Sanrio needs to work on with changing majority of people's pre-conceived image of Hello Kitty. 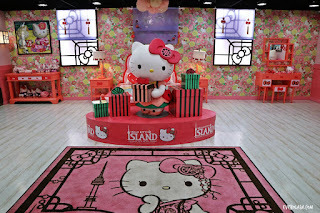 If it can work for Hello Kitty, maybe it can work with the rest of Sanrio's kawaii characters as well. As like many others, I took many videos and photos of nearly everything inside the Bow Room. We were seated to the left side of the room and was immediately greeted by a female server. She took down our order for a Lychee Peach tea. 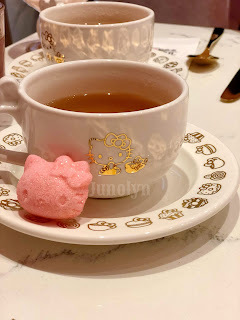 The tea was served with the cutest pink Hello Kitty shaped head sugar. Just adding the cute sugar in your hot tea makes the taste even sweeter. I really enjoyed the flavor. 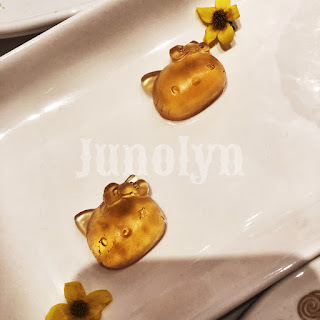 You can try two flavors of the tea, but we sticked with Lychee Peach because I planned to come again for another visit. Next, we were served a three tier tray shaped like a Hello Kitty head. There were three plates in the tray. 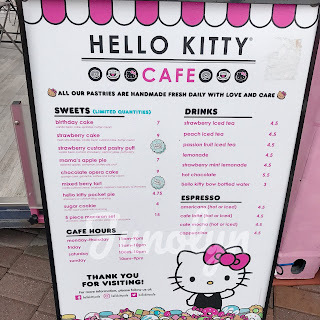 The only one that I saw that had a Hello Kitty face was the Hello Kitty mini cakes on the top row with ordinary biscuits. The second row was dedicated to a bow themed raspberry macaron and a mini apple themed cupcake. They were both served with an ordinary chocolate cake. The last row was the best out of all three rows. 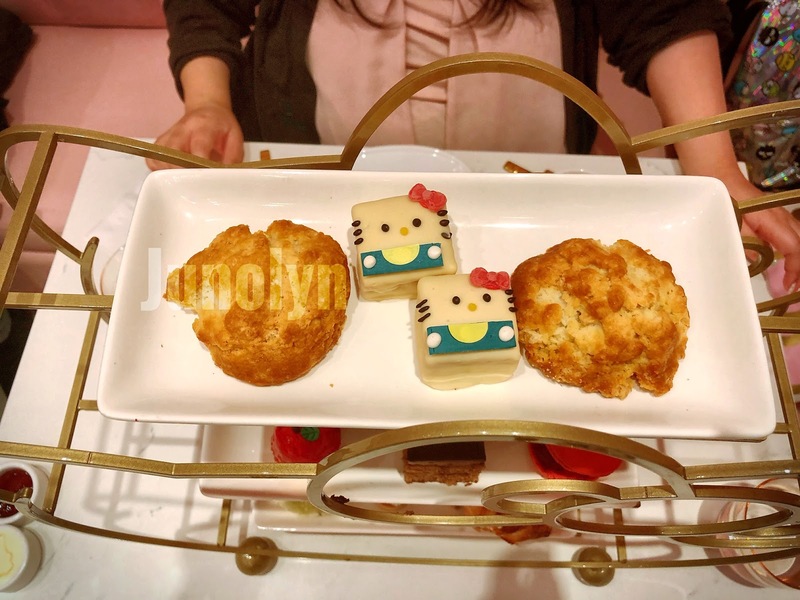 The three selections were all finger food themed: mini salmon croissant sandwich, a mini italian-like treat, and a mini Hello Kitty shaped bread with cucumbers on top. One thing to note is that if there are more pastries that look like normal food, then isn't that a big fail to the character's food creations appeal? Is this another strategic move to replace that one Hello Kitty mini cake with another themed Hello Kitty face creations (down the road) -- in order to entice the Hello Kitty fans to return back to document their experience again? Will that work? 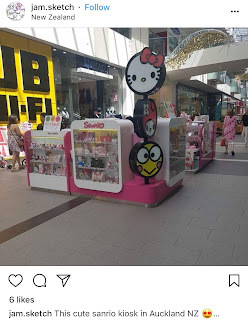 It might not work for casual Hello Kitty enthusiasts because not everyone faithfully follows and track Sanrio news and updates. Majority of consumers that are needed are the curious bystanders, who are not fans of Hello Kitty. If you want to stay in business for the long run, you would need to attract those type of customers. 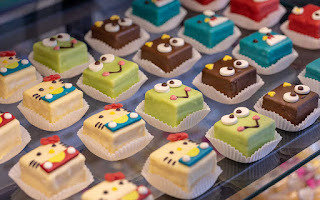 It is a FOOD business that Sanrio has put it's foot in the door's industry. Sanrio needs customers to return to be able to achieve longevity and keep profits rolling in. Depending solely on decor to attract customers are not ideal if you want to keep the door open for business. 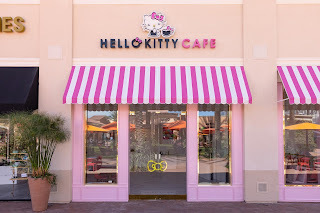 I actually saw people go into the cafe, took a selfie picture with the Hello Kitty decor and leave without purchasing anything. They got what they wanted: a photo to brag about on social media! 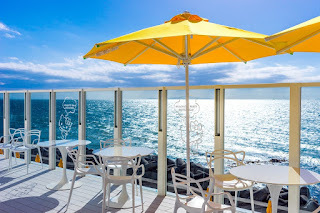 Another major factor that made my overall experience was the friendly staff and that the room was not full max capacity for the tea service. If it had been a full room of people, I would not be able to get my photo opportunities at the cocktail bar area. 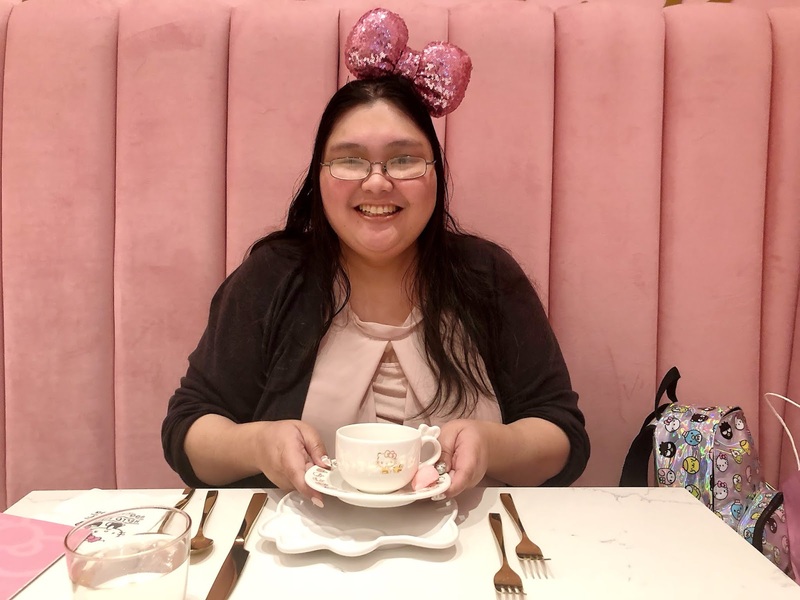 The experience added to my fun time was that I was able to purchase a chubby bunny bow headband before entering the Bow Room. Wearing a bow head band made the moment even more special. 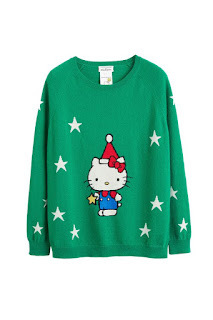 Before that day, I had already planned out my outfit to wear at the Hello Kitty Cafe. Since it was a high end tea service, I wanted to look my very best. I opted for a dressy casual style outfit. 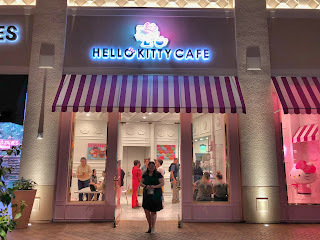 I didn't have any Hello Kitty theme dressy type of blouse and I didn't feel comfortable wearing my Hello Kitty black and red themed Torrid skirt. I was aiming for a sweet image of light pink and black dressy outfit. I wanted to look and feel classy to match with the Bow Room. After having such a memorable day, I realized that I was very lucky to end up with a friendly server because not everyone's experiences turned out so great. There are those who come and have a less of a fun time when their server is rude or unfriendly towards them. 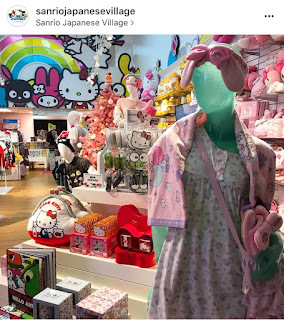 I would suggest to Sanrio to have an option to leave feedback on their staff service on their website. While it is about the food, it is also about the experience. One unfriendly server can ruin everything. It can ruin your mood and spirit. The more complaints on one server should tell management that they need to replace the server or give better training. The HK mini cakes was refreshingly moist and soft to slice into with my fork. If it had come directly from the fridge, I think the outcome would be much different and less enjoyable. I liked the taste, but I couldn't eat more than one. I like my fair share of sweets, but just not too much at one time! The Apple cupcake was very average. Not overly too sweet, which was good. Although the bottom part was a tad dry. Not too moist. Chocolate chocolate cake was a bit bland in flavor. It was Logan's favorite out of this whole row. My favorite on the 2nd tier was the raspberry macaron. The cucumber with dill cream cheese seemed to be on a soft HK shaped bread. The dill cream cheese mozzarella vine tomatoes on pesto tart shell reminded me of an Italian indulgence. 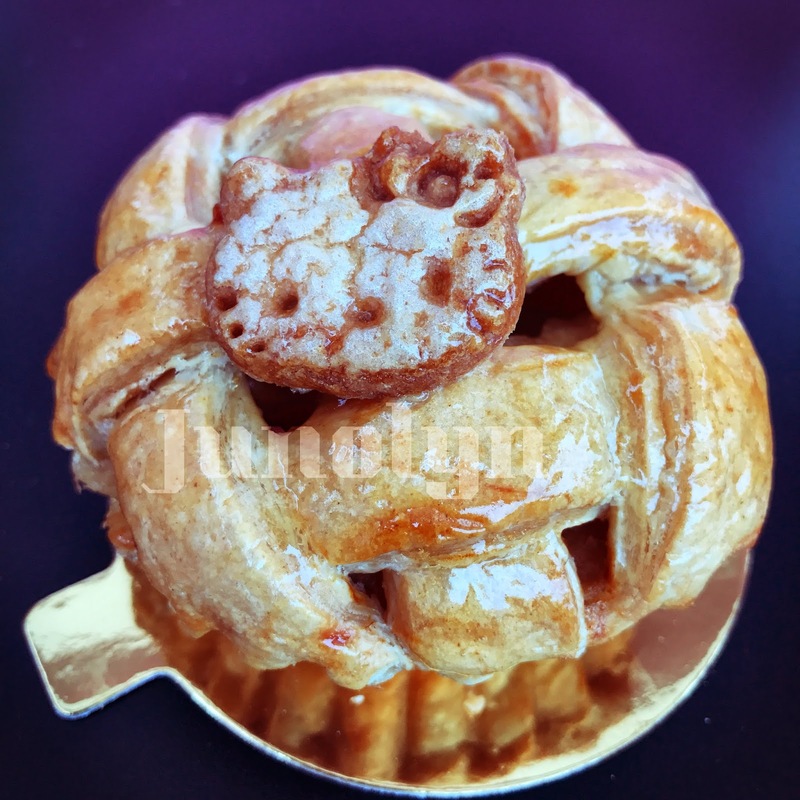 The cheese flavor over the crisp crunch of the tart shell was like a taste of heaven. 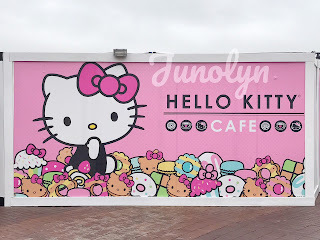 It's like a tease of something good that you wanted more of, but you can't get because this cafe serves fast casual food. 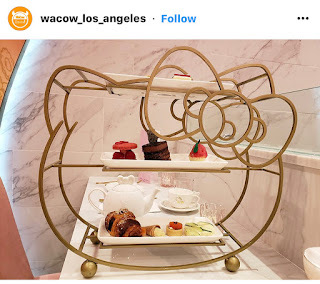 They might want to rethink that style for a VERY expensive high end tea service. At least in Disneyland for the expensive price for a high end tea service, you get a better deal with the portions! This is like being stingy and overpriced in comparison. It just serves as a reminder to get a real meal afterwards. The creamy egg salad in the cone is definitely the 2nd best out of the finger food theme. The paprika salmon in the pretzel croissant mini sandwich was the best one in the entire tray selections. You will wish that the size of the sandwich was much larger. The croissant was buttery with a crispy texture that paired off well with the salmon. It was excellent. First off, I am not much of an alcohol drinker. After my night at the cocktail bar, I ended up wishing not having consumed so much alcohol without eating something first. Since I'm Asian and as soon as we left Irvine Spectrum, I realized that I (most likely) have an alcohol allergy. I started feeling sick and having a difficulty time of breathing. Luckily, I had water in the car. Drinking water helped me. The experience will be my major lesson to avoid whiskey drinks or consuming too much. Hence, my choice of cocktails. I chose the best ones that had a Hello Kitty face. This was the reason why I was there. It might annoy one of the bartenders with the same orders, but it's the main draw of the bar. No bar has it. 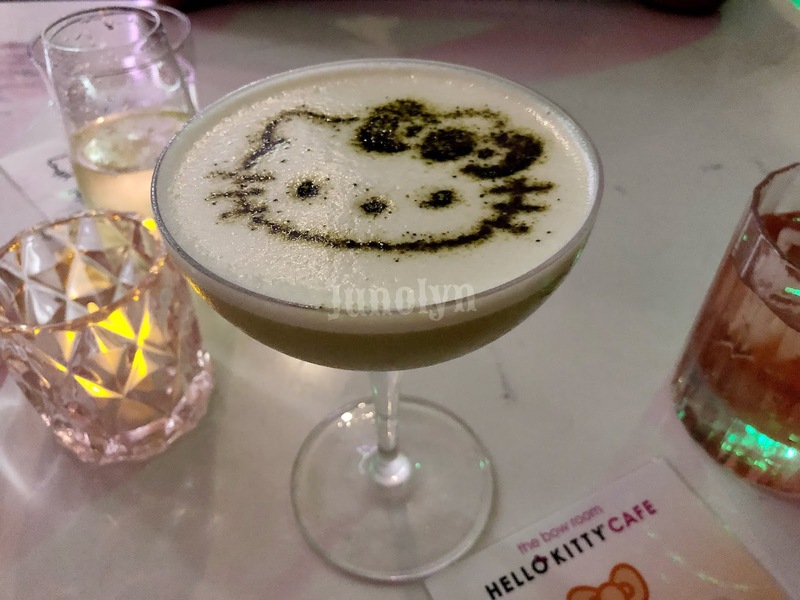 Don't let them sway you if you want to try a Hello Kitty cocktail drink. You can always return for the next visit to try their other alcohol drinks. Just saying. Their other choice is the cream (cool whip) over fresh strawberries with champagne. I thought it was all in one glass and that the champagne was under the strawberries. It's not. They give you a separate glass of champagne. Logan liked the champagne the best out of all three drinks. My favorite cocktail drink was the matcha matcha because it was the sweetest one. I don't overly like the strong taste of alcohol. 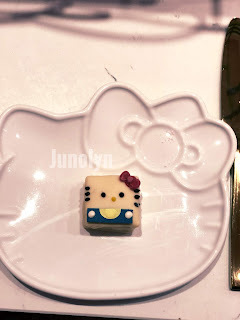 For Hello Kitty, I'll try something new. I found out that I enjoyed this Japanese style cocktail. 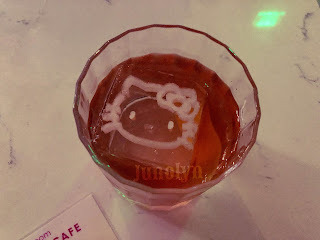 Both Logan and I disliked the Negroni drink with the Hello Kitty ice cube. He didn't understand why we just couldn't take the ice cube home. LOL. We left it unfinished-- barely touched because I already got what I came for: a photo and a video to document my experience. Creativity: it's fast food casual style. There's not much effort added to the character factor. No quality to the art design. Decor: it's the only thing going for them. You are paying for the experience like you would in Disneyland or Disney World. 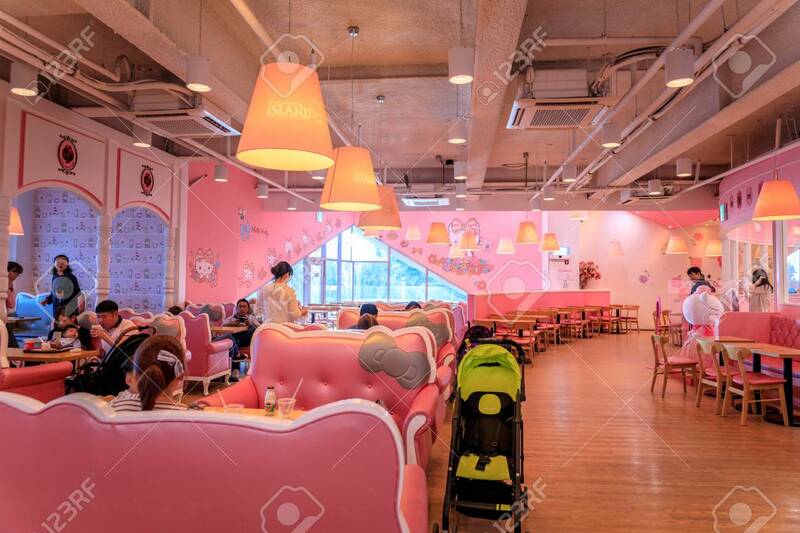 At a character cafe restaurant, wall and dining decor is more attractive than a few kittified selections. It's a character cafe that is NOT known for it's character art creations, but of it's DECOR. It should be the reverse. 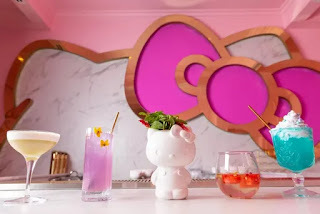 Presentation: Tea service and cocktails are what separates them from all the other character cafes. The pastries are pre-baked off-site. Not much effort for the staff. They don't cook in the storefront. They don't offer to warm your out-of-the fridge pastries. It's a pre-packaged menu. It's not a real cafe restaurant that cooks on-site. 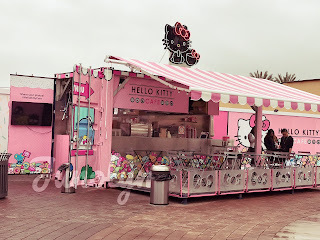 Sure, they have ORDINARY non-HK themed donuts, but aren't they pre-baked off site and warmed on-site with a machine? 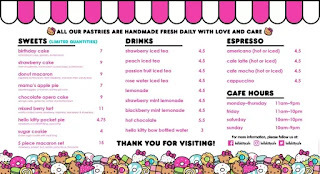 How is it that a real bakery can provide a fresher and tastier alternative? Too much effort to decorate the donuts, huh? Another note: only 5 artsy cocktails from the rest of alcohol drinks. Ratings was taken off mainly for the food factor because it IS a cafe restaurant, meaning their genre is the food industry. 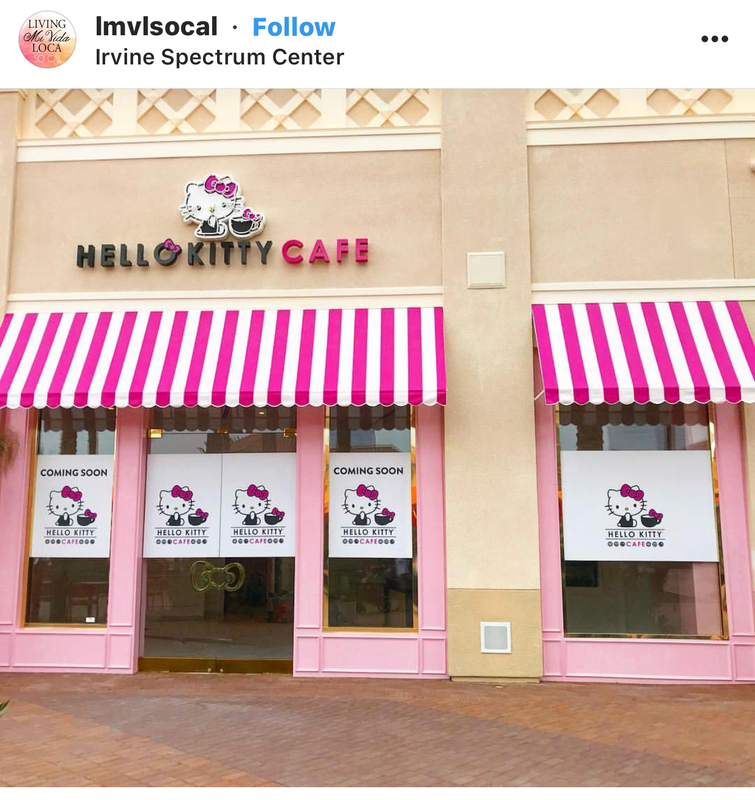 Respect the food industry by serving 70% kittified food if you're going to put out that it's a character brand collaboration within the food industry. 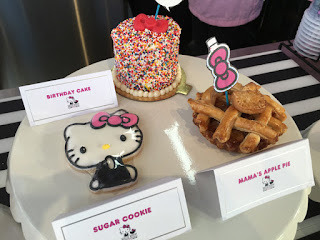 There are like 35% Hello Kitty themed art food creations that are fast casual style. Personally, I've seen better quality food creations. 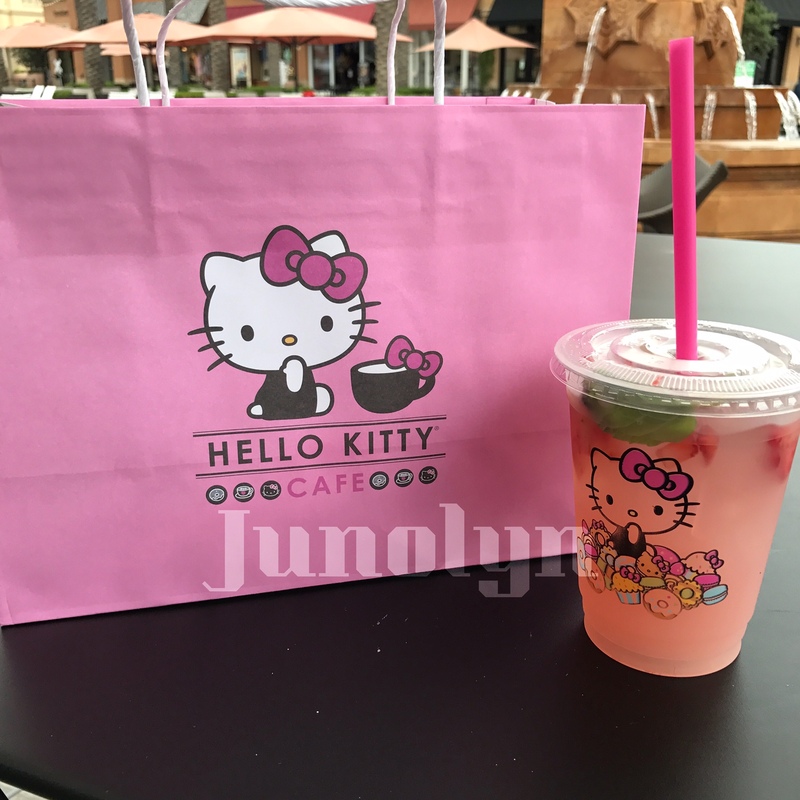 Logan thought I was being generous to give a 3.5 rating as he is not a fan of Hello Kitty or Sanrio. 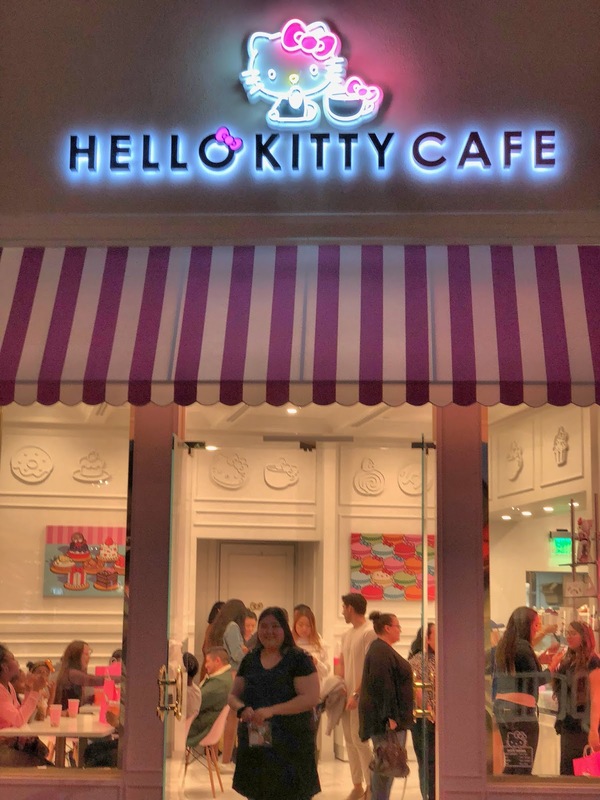 I thought Hello Kitty Grand Cafe deserved a 3.5 because I saw potential room for improvements. 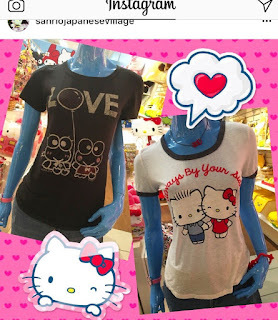 If Sanrio does not listen to feedbacks, I do not see it lasting in longevity. As years pass, they might end up with no reservations needed because there would be no more hype to draw in customers. 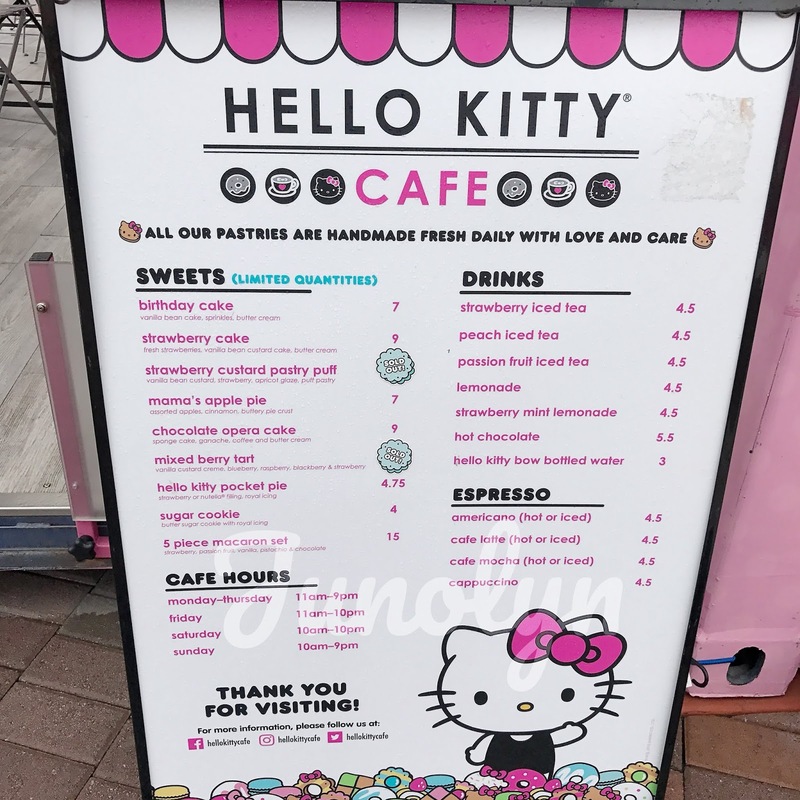 With just the truck, kiosk, and mini cafes without the tea service and bar-- the ratings would have been far lower because honestly, it's a gimmick. A real bakery offers better tasting and fresh selections than what Sanrio serves. Even fast food chains are more preferable! 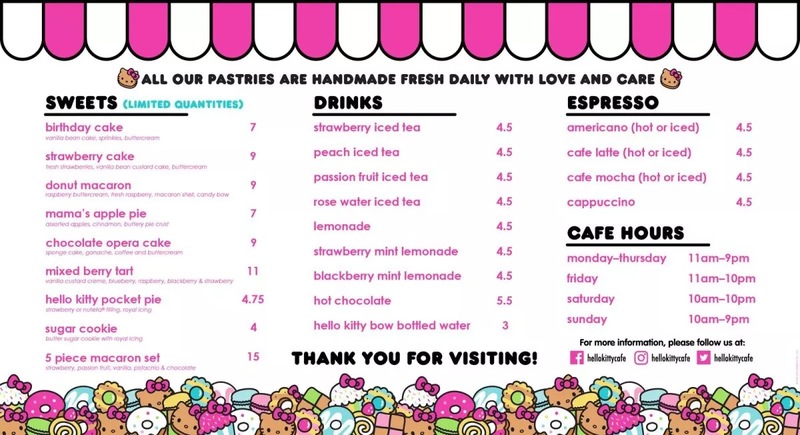 It's mainly about the food if we're only reviewing the truck, kiosk, and mini cafes. It doesn't compare in most people's minds-- especially if they are unbiased and bystanders, not even a fan. They are more important because they are the general public. We, enthusiasts and Collectors, are smaller in numbers with comparison to the whole world. Playing advocate here, I think the Grand Cafe concept will last longer than Asia's short life spanned character theme cafes. 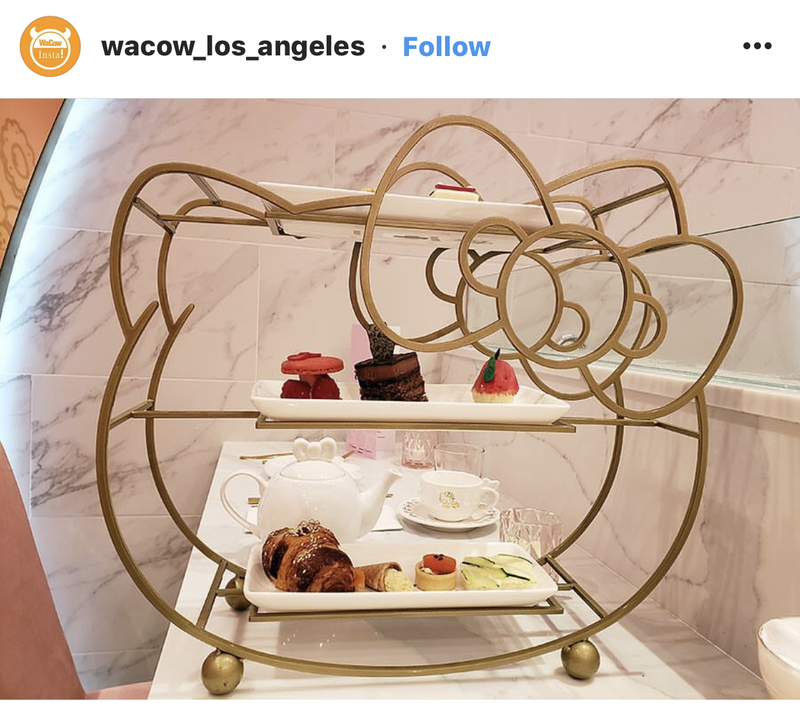 Irvine has something that they didn't: high end tea and bar service. I will give them props for the new concept. Unfortunately, permanent status is the big question here. Is there longevity for these type of businesses? 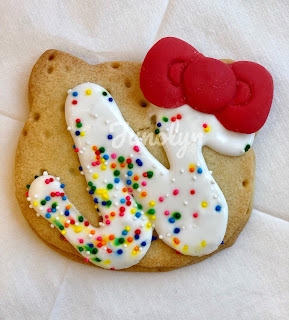 I say Mickey Mouse character cafes can thrive in the very successful Disneyland theme parks. Hello Kitty Grand Cafe does not have a giant sculpture on the outside design building like it does in Japan's Hello Kitty Smile gourmet restaurant. But then again, Hello Kitty Smile offers much more than being an ordinary restaurant. It has the giant sculpture worthy of bragging rights. 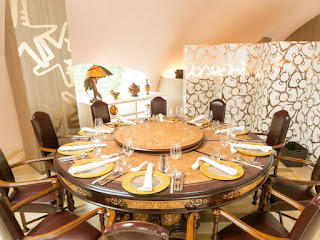 It has formal dining restaurant (with professional chefs) and high end tea service. It has an immersive gallery and theater. 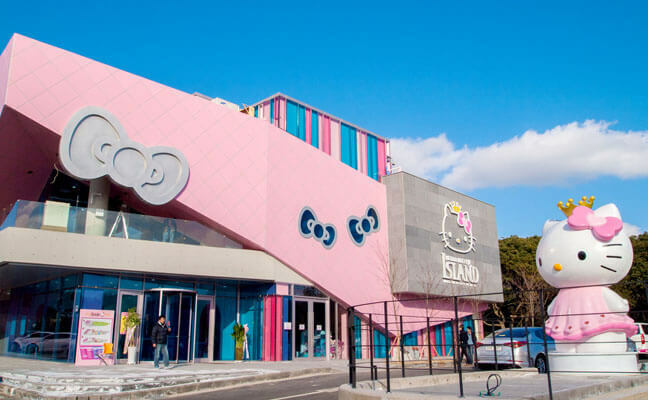 It has a souvenirs store. It has everything like what Disneyland offers with the exception of rides and entertainment. 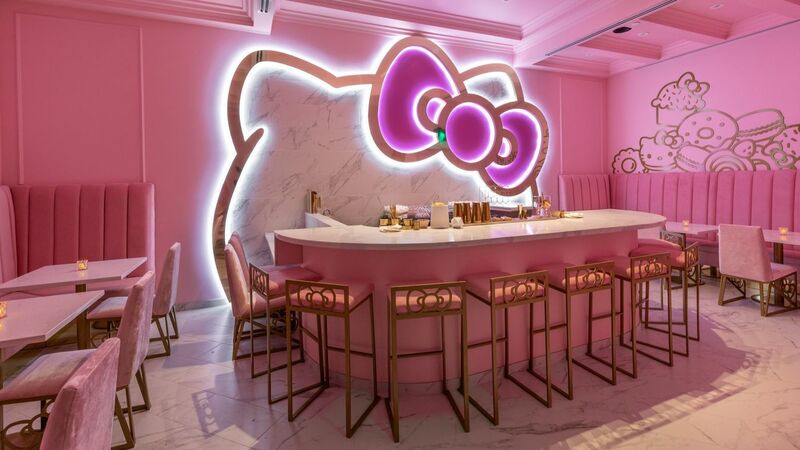 Hello Kitty Grand Cafe just doesn't compare to Hello Kitty Smile. 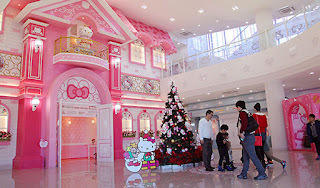 For that reason, I do believe that Hello Kitty Grand Cafe would thrive in it's own Sanrio Kingdom theme park. It would actually stay in business. If the theme park is up to quality and not cheap looking (not kitsch), it would attract visitors year long round. 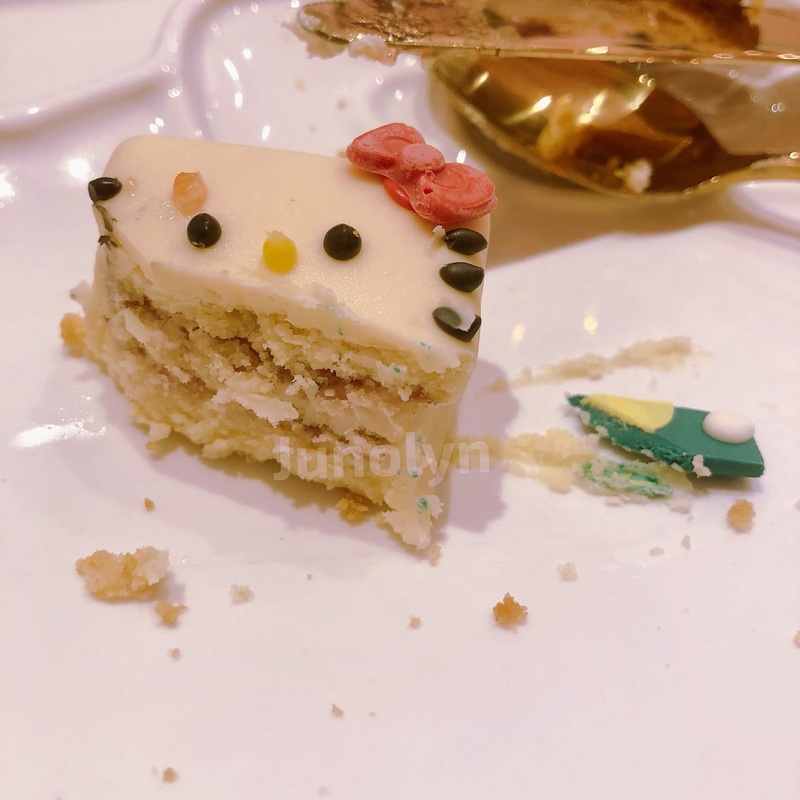 Sanrio needs to remember that they cannot cut corners because it can backfire on them like what happened with the Sanrio Festival idea. 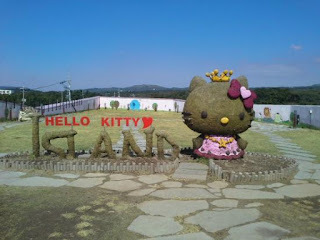 Hello Kitty Grand Cafe should last longer than what statistics say, but don't quote me on that one. 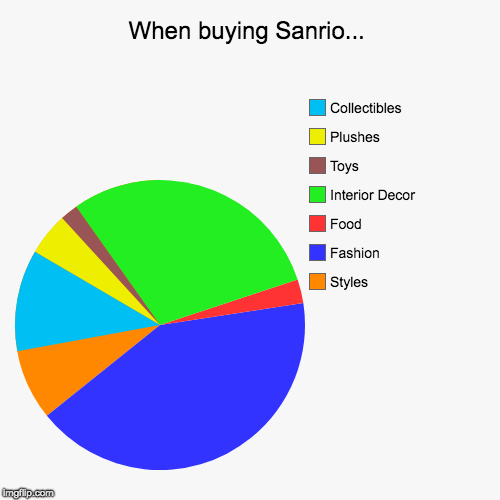 It really depends on the next strategic move on Sanrio's part. A balance between the finger foods and the sweets. There were just too many sweets. Sugar overload is not preferred. The exclusive stuff that runs out of stock quickly should be reserved to The Bow Room customers. We should get first dibs on it since we're paying more. 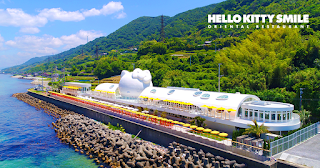 "It comes complete with a gourmet restaurant, high tea annex, outdoor terrace, theater, shop, and more. 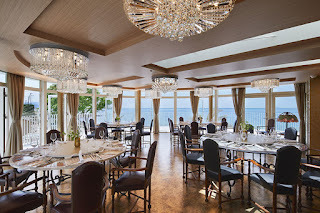 The main dining area serves creative dishes influenced by both Japanese and Chinese cuisines prepared by award-winning chefs – restaurant goers can expect high-quality ingredients such as locally sourced shark fin and abalone. In an annex area, high tea is served daily, where more than 50 types of tea can be enjoyed with Hello Kitty-inspired pastries and treats. There is even an immersive theater where projection-mapping, spherical color-changing LED lights, and other design details are used to bring Hello Kitty's world to life. 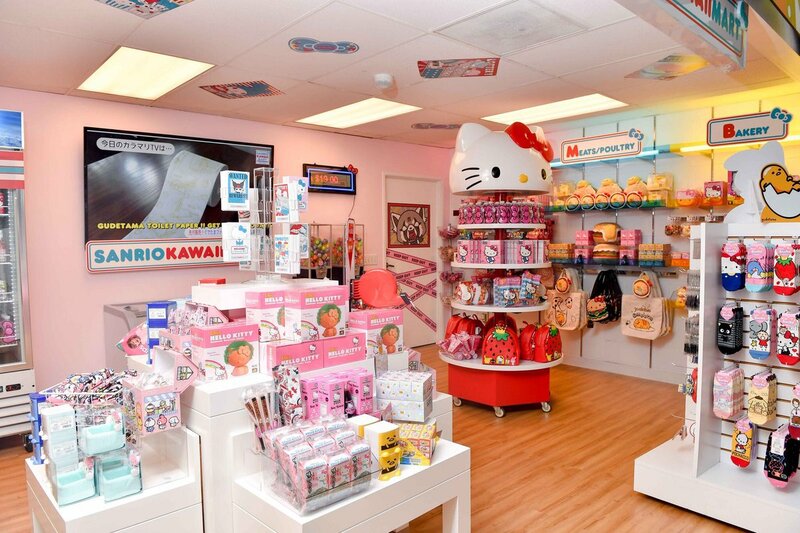 Before heading out, guests can visit the Hello Kitty shop to pick up gifts and souvenirs. If this isn't enticing enough, the exterior of the new space boasts a 36-foot tall Hello Kitty sculpture that looks right out onto the water." 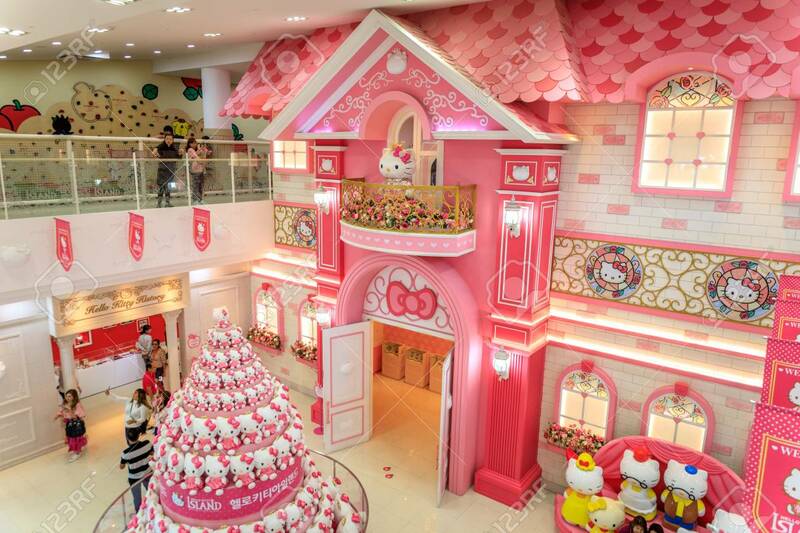 Hello Kitty Smile is definitely on my bucket list to visit. I hope I can achieve this goal one day.